Listed companies would be liable to spend Rs 8,100 crore (Rs 81 billion) in all on corporate social responsibility for 2012-13, with the new Companies Act making it mandatory for them to earmark two per cent of their net profit (the average of the past three years) on such activities. 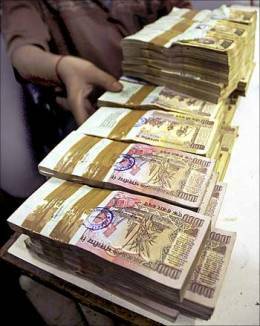 For FY14, the first full year of the law’s implementation, the spend could go up to nearly Rs 8,700 crore (Rs 87 billion), given that India Inc’s profitability has grown at a compounded 7.5 per cent annually in the past three years. 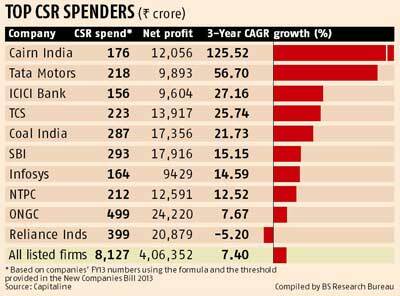 The total spending by all companies will be higher, as these estimates exclude unlisted companies. The Bill makes CSR spend mandatory for every company with a net worth of Rs 500 crore (Rs 5 billion) or more or turnover of Rs 1,000 crore (Rs 10 billion) or more or a net profit of Rs 5 crore (Rs 50 million) or more during any financial year. Companies will have to constitute a CSR committee of the board of directors, consisting of three or more, of which at least one director shall be independent. With the implementation of this law, Oil and Natural Gas Corporation will be India’s biggest spender on CSR, contributing nearly Rs 500 crore, based on the past three years’ numbers (see chart). It will be followed by energy and petrochem giant Reliance Industries, which will have to fund CSR projects worth Rs 400 crore (Rs 4 billion) to meet the guidelines. India’s 10 most profitable companies will together spend Rs 2,625 crore (Rs 26.25 billion) on activities including promotion of commerce, art, science, sports, education, research, social welfare, religion, charity and protection of the environment. The spending will, preferably, have to be in the immediate vicinity of their businesses. For manufacturing companies, which typically have factories on the outskirts of cities or in rural areas near the source of raw materials, the spending is expected to improve the quality of life of villagers. India Inc is treating this legislation as a positive development, which will help them earn the goodwill of locals, besides making them a partner in the government’s inclusive growth agenda. “We believe in inclusive growth and fully support the intent behind this legislation,” says a spokesperson at the Aditya Birla Group. The conglomerate’s CSR spend already exceed the minimum stipulated by the government. team at the group looks after its CSR initiatives. The Tata group follows a two-tier structure, where both individual companies as well as the group holding company, Tata Sons, and its key shareholders, the Tata trusts, run CSR programmes. “All Tata group companies have their own CSR team, who work with the local community. This is independent of the programmes run by various Tata trusts,” says a spokesperson at Tata Sons. The measure will legalise the various means through which companies used to ensure smooth functioning of their operations in India’s hinterland. “Now, the benefits will flow directly to local residents, a better option over bribing a handful of influential people. “This will earn us goodwill and trouble makers will have less incentive to create nuisance,” says a senior official at a leading cement company. Some executives say the alternative to mandatory CSR spends, like an additional CSR cess on corporate tax, would have been worse as it would have raised the tax rate without providing any benefits to the companies. “Many companies don’t see it as a distraction but an intrinsic part of their business and a way to stay engaged with the community in which they operate,” says Abhay Gupte, senior director at Deloitte Touche Tohmatsu India. Companies, meanwhile, have initiated efforts to meet the legislation. “We track about 150 of the BSE 500 companies and are seeing that they are formalising an internal CSR structure. There is a thrust in hiring for CSR personnel, especially people at the top, besides formalisation of CSR policies and budgets,” says Jitten Veer Bhasin, chief executive officer, CSR India, a consulting firm engaged in promoting responsible business practices.